Remember that scene in Pirates of the Caribbean: The Subtitle I’ve Already Forgotten, where sirens attack some hapless pirates in a rowboat? The pirates are gleefully enchanted by the siren’s singing, only to then be dragged to their deaths. Final Cut Pro X is like that. Except with the bitter irony that it wouldn’t be possible to cut Pirates of the Caribbean: The Next One using FInal Cut Pro X. On the surface, everything is very shiny and modern. The interface, which was somewhat unfairly compared to iMovie, is a much needed replacement for the very stiff throwback to Avid MediaComposer that was Final Cut Pro 7. It reminds me a great deal of Kai’s Power Tools, and it’s just as much fun to play around with. There’s an event library, which gives you some of the functionality of Final Cut Server, in that you can have media that shared between projects, like stock footage. There’s a lot of processing that goes on in the background. There’s some crashes too, but that’s to be expected with shrink-wrapped software. There’s a learning curve here, as everything now has a different icon from it’s predecessor, but that was to be expected. You can’t make an omelette without breaking some eggs, right? Well, in the case of FCPX, those eggs are everything a professional editor needs to do their job. It seems like utter madness to release a version of Final Cut Pro that doesn’t import projects from FCP7, that doesn’t provide EDL support (in fact, it is currently impossible to online anything created inside FCPX), that there’s no electronic manual (other than the online help) and that doesn’t have deck control, but that’s what we’ve got here. 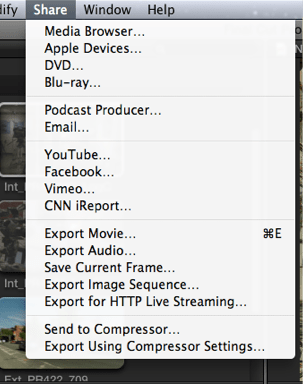 Instead, there’s the ability to import from iMovie, publish to YouTube and automatically colour-correct everything. I have absolutely no problem with any of that, but those features are clearly aimed at a different audience, one I suspect already uses iMovie for videoblogging and is now looking to do a little more. 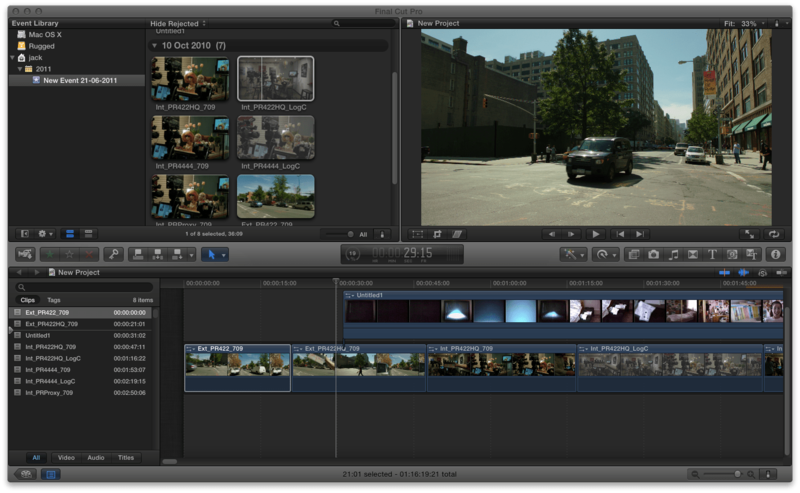 FCPX is clearly not aimed at post-production professionals who are hoping for an improvement over FCP7. Which begs the question, why call it Final Cut Pro at all? Final Cut Pro was always the underdog to Avid in the high-end editing game, but since the release of Final Cut Studio, it was increasingly gaining ground within Hollywood. Hell, I even used FCP 7 to online The Bengali Detective. So it is astonishing that Apple would suddenly do a U-turn and leave that market left out in the cold. Editors need to be able to preview their work on a broadcast monitor. They need to be able output edit decision lists in one form or another. They can’t, and yet the wealth of output options can only suggest that this was entirely deliberate. There were a lot of people who were worried FCPX would be dumbed-down, on the basis that the interface was very similar to iMovie. Then the Apple PR engine rolled out a bunch of testimonials from people claiming that it was going to be great. Even Steve Jobs got in on the act. But in all honestly, nothing about it seems dumbed-down. There’s an absolute ton of innovation in there, a load of features and performance improvements that people have been clamouring for. You just can’t shake the feeling that every single omission is deliberate. It’s just that, in true Apple style, they seem to think they can tell editors how they can be doing their jobs better. At best it shows a lack of understanding of real-world editing (i.e. not direct-to-web editing), and at worst it shows contempt for its own market. It’s not that it isn’t a great product for the right audience. I dare say it will get some use from me on specific, straight-to-web jobs. But an upgrade it is not. FCPX is also the first Final Cut Pro that is only available via digital download. It’s reasonably-priced because of this (at $299) but then again, many people who paid, thinking they were getting an upgrade to Final Cut Pro will find themselves out of luck, and with no recourse for a refund.